What types of membership do you offer and how much does membership cost? The RHS offers a range of membership types to suit all needs from individual (perfect for 1 or 2 people) through to joint (ideal for families), student (please see membership T&Cs) and life membership. View a full breakdown of the membership types on offer. Please note joint membership is only available for two people living at the same address. Please note: Only Guide and Registered Support dogs are allowed into the four RHS Gardens and all RHS Shows. No pets allowed. Membership card is for the sole use of the member. Please bring your membership card with you when visiting our gardens. You may also be asked to show an alternative method of identification. What are the benefits of Life Membership? 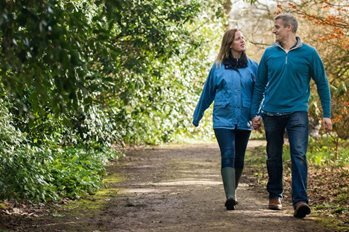 With Individual Life membership you’ll receive all the benefits of RHS membership, unlimited for life including free entry to the four RHS Gardens with a family guest or two children (aged 5-16 years). With Joint Life membership you both enjoy all the benefits of RHS membership for life. As Joint Life members you both enjoy free entry to the RHS Gardens each with a family guest or two children (aged 5-16 years). Both members also enjoy free access to more than 200 RHS Partner Gardens. Please see our RHS Partner Gardens page for details of opening times and dates when free to members. What is included in the Life Membership pack? When you pledge your support to us for life (as of April 2012), you’ll receive all the benefits of RHS Membership, unlimited, for life. Plus, you’ll also receive a luxury membership pack which includes: your handbook, a limited-edition RHS Life Member pin badge and an exclusive RHS Life Member Gardening Journal so that you can keep note of all your horticultural inspiration. How can I apply for membership? You can pay for your membership online by annual Direct Debit or by credit or debit card. If you pay by card, the full annual payment will be charged to your card within a few days of completing the form. If you would like to pay by any other method, please contact our Membership Services on 020 3176 5820 (we’re open weekdays 9am – 5pm, excluding Bank Holidays). Do you offer concessionary memberships? We only offer a concessionary life membership for those over the age of 60, we do not offer concessionary rates on standard memberships, but our aim is to keep membership prices as low as possible for all. Membership subscriptions are critically important to the RHS because we are engaging in more work now than at any time in our 200-year history. As a registered charity that gets no Government funding, membership brings in much-needed income to help secure gardens and gardening and advance our charitable objectives. This includes growing our RHS Campaign for School Gardening, engaging communities through Britain in Bloom, developing our Gardens, furthering research into pest and diseases affecting gardeners today and enabling members to share our vision 'to enrich everyone’s life through plants, and make the UK a greener and more beautiful place'. If I go to one of the four RHS Gardens today, can I take out a membership when I arrive? Yes, you can choose to join at the garden entrance at all our gardens, please just ask a member of staff. Alternatively, if you pay the normal entry fee at the main entrance, hold on to your receipt and if you take out individual or joint membership as you leave the garden you can exchange up to a maximum of two garden entrance tickets per membership on the day of your visit. I have joined the RHS today. How long before I can purchase a ticket online? If you have joined by direct debit, or via this page, it takes up to 48 hours for your membership to be recognised with our online booking system. Please note you should only select this option if you are buying a membership and ticket together. If you are already a member please log in (after 48 hours for new members) to access member rates. Does RHS membership guarantee me tickets for RHS Shows including RHS Chelsea Flower Show? We can’t guarantee RHS Show tickets for any of our visitors including members, as all our Show tickets are subject to availability. Members enjoy a priority show ticket booking period every year before Show tickets go on general sale to the public. To give you the best chance to get the availability you need for a Show, we encourage our members to book during our priority booking period for the following years shows or to book for another show. Plus, take advantage of our FREE RHS Shows at RHS Garden Wisley, Hyde Hall, Harlow Carr and Rosemoor. What is the benefit to me of paying by Direct Debit? Direct Debit payments are secure and when you choose to pay this way you are guaranteed never to miss a day’s RHS membership. The Direct Debit will be taken as one annual payment. We’ll always write to you before renewal to remind you of the cost and date. Plus, you’ll be helping the RHS save money so we can do more charitable work. What date does the membership start from? You can start to use your membership as soon as you receive your order confirmation email with your membership number. Your membership will be processed and will start shortly after you join online; your welcome pack including your membership card and RHS Members' Handbook will arrive within 10 working days. For gift membership, the membership is valid for one year and will start once the gift recipient has activated their membership online or by phone, and a membership welcome pack has been received. How long does the membership welcome pack take to be delivered? You should allow 10 working days for your membership card and RHS Members' Handbook to be posted to you. What does the RHS do with money from members? We use money from membership subscriptions to help fund our charitable work. Together, we’ll be helping almost four million schoolchildren sow, grow and learn through our Campaign for School Gardening as well as inspiring communities right across Britain to get gardening. Can I visit an RHS Garden with my carer on my membership? Yes, we offer free entry for essential carers accompanying visitors with a disability, when you visit one of the main RHS Gardens – Wisley in Surrey, Hyde Hall in Essex, Rosemoor in Devon and Harlow Carr in Yorkshire. If your membership has a guest entitlement you can still use this in addition to your carer. Carer arrangements for more than 200 partner gardens you can visit with your RHS membership can vary, please check before visiting, details can be found in your membership handbook or by visiting our Partner Gardens page. Can I take out a membership as a gift for somebody else? Yes, you can buy someone membership as a gift. You must specify that it is a gift at the time of purchase and choose if you wish the gift pack to be sent to yourself to wrap up, or direct to the gift recipient. If you choose for the pack to be sent to the gift recipient, we can include a personal message from you. How long should I allow for a gift membership pack to arrive? Please allow 5 working days for delivery (14 days for deliveries outside the UK). How much does gift membership postage cost? Delivery is free to UK addresses (total cost of gift membership is £63). Delivery to European addresses is £3 (total cost is £66); rest of world costs £7 (total cost is £70). What is included in the RHS Gift membership pack? RHS Gift membership comes in a beautifully presented deluxe gift pack, which includes two packets of seeds (EU only), two luxury note cards, a voucher for a free RHS tote bag and £5 to spend at RHS Shops and Plant Centres. We’ll also include a unique activation code in the gift pack so the recipient can choose when to start their year’s membership. When you order your Gift membership, you can also choose to include a personal message to the gift recipient of up to 150 characters. The Gift pack will arrive in a plain envelope with the RHS logo on it. You’ll support our charitable work with every Gift membership purchase. Thank you. You can renew your membership online, by phone or post. You don’t need to do anything until you receive your renewal notice which will include your renewal date and the cost of your next year’s membership. Your renewal letter will arrive approximately six weeks prior to your renewal date. Once you have received your letter you can renew online or call 020 3176 5820 (we’re open weekdays 9am – 5pm, excluding bank holidays). Gift Aid is a Government scheme that adds 25p to every £1 you give the RHS – at no extra cost to you. Gift Aid is an easy way to ensure that charities receive more benefit from money given to them. If a donor has signed up for Gift Aid and is a UK basic or higher rate taxpayer, HM Revenue and Customs will give the charity an additional 25p for every £1 given by the donor. RHS members who sign up to Gift Aid will be making a much-valued additional contribution to the charitable work of the RHS. Why does the RHS need Gift Aid? The ability to claim Gift Aid income has become more important to the RHS because, quite simply, we are engaging in more work now than at any other time in our 200-year history. Gift Aid will bring much needed income to help secure a future for gardens and gardening, and advance our charitable campaigns – growing our Campaign for School Gardening; engaging communities through RHS Britain in Bloom; developing our RHS Gardens; furthering research into issues affecting gardeners today – to name but a few. How has RHS membership changed with the introduction of Gift Aid? The main change concerns the free guest that members can bring to an RHS garden. In order to claim Gift Aid, HM Revenue and Customs’ rules state that the benefits of membership can only be taken by the donor and their family. So all new RHS members will continue to be able to take a guest to an RHS garden for free, but this guest must be someone in their family. Am I eligible to make a Gift Aid declaration to the RHS? To qualify for Gift Aid you must pay an amount of UK tax (Income Tax and/or Capital Gains Tax) at least equal to the amount of Gift Aid claimed on all your donations in that tax year. If you pay less UK tax (Income Tax and/or Capital Gains Tax) than the amount of Gift Aid claimed on all your donations in that tax year it is your responsibility to pay the difference. How do I know if I pay income tax? Look at papers relating to the monies paid to you. Savings/bank accounts normally deduct tax at source so a bank statement will normally show if tax has been deducted. Individual share dividend certificates also show where tax has been deducted. How do I know if I pay income tax on my pension? As a pensioner you will receive a P60 each year, which will show any tax deductions. Do I pay capital gains tax? You are usually aware if you pay capital gains tax, as you would have had to declare it. This would have been declared by yourself or by your accountant/financial advisor. I don’t pay tax but my partner does. Can I still give Gift Aid? If you have joint membership and your partner pays tax then he/she can tick the Gift Aid box provided that the membership is paid either from your partner’s account or from a jointly held or named account. If you are an individual member, you must personally pay for your membership in order to tick the Gift Aid box. I would like to buy RHS membership as a gift for a friend. Can I still give Gift Aid? No, the RHS cannot claim Gift Aid if you purchase membership on behalf of a friend. But if, at their renewal, your friend chooses to pay for the membership themselves and is a tax payer, then they can tick the Gift Aid box when their membership is due for renewal in a year’s time. Do I have to indicate that I have made a Gift Aid declaration on a tax return? Not if you are a standard rate tax payer and do not receive a tax return from HM Revenue & Customs. However, if you do receive a tax return, you must declare the information. If you pay tax at the higher rate, you can claim further tax relief via your Self Assessment tax return (higher rate taxpayers can claim back the difference between basic rate and higher rate tax). I’ve already made a Gift Aid declaration to the RHS. Do I have to fill in one every year? No. All your donations and/or membership subscriptions are covered under one declaration. You can cancel your declaration at any time by contacting our Membership Services Department (for example, if you cease to become a tax payer) on 020 3176 5820 (9am – 5pm Monday to Friday; excluding bank holidays). Can I change my mind once I’ve joined the scheme? You are entitled to cancel your Gift Aid declaration at any time within the 30 days after this letter has been sent to you. Should you choose to withdraw from the scheme at any time in the future, or if you no longer pay enough income or capital gains tax to cover the amount claimed by the RHS, please just let us know and we can take your donations and/or membership subscription out of the Gift Aid scheme.